One of my most highly anticipated films of the year, Bohemian Rhapsody had me nervous. 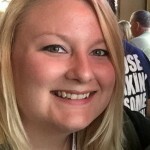 The early buzz was mixed, and I wasn’t sure on which side of that divide I would land. 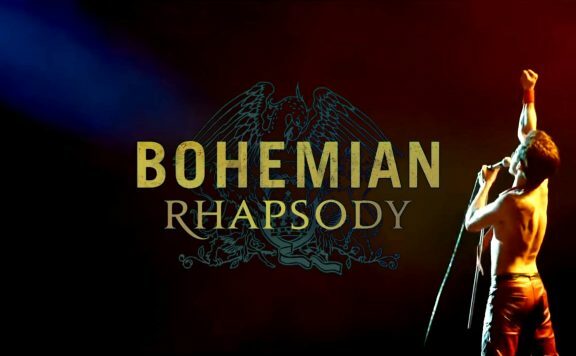 Bohemian Rhapsody tells the story of Freddie Mercury (Rami Malek) and the formation of the iconic rock group, Queen. The film nicely bookends itself both starting and ending with the Live Aid performance in 1985. With an opening that stops just short of delivering that big rock and roll moment you’re looking to see, it leaves the audience craving it and keeps them engaged until it finally pays off. Rami Malek as Freddie Mercury gives a transformative performance. He embodies everything that we loved about Freddie Mercury and brings it to the forefront of the film. Everything from his mannerisms to his voice is spot on bringing Freddie to life. The way he trots about the stage and the delivery of his sassy lines are as big of highlights in the film as the iconic concert scenes with our favorite songs. He plays the duality of his character so well, balancing his flair and passion for life with the emotional struggles and substance abuse issues he faced every day. 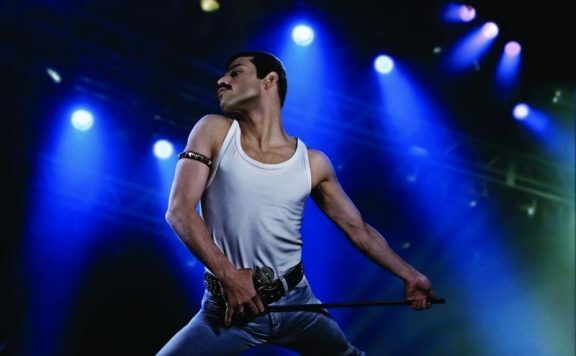 Malek leads the film triumphantly as Freddie Mercury and leaves no question of his acting abilities. The supporting cast is spectacular as well, noting particularly the performance by Lucy Boynton as Mary Austin that builds itself up over the entire course of the film. The rest of the members of the band are outstanding and perfectly cast. 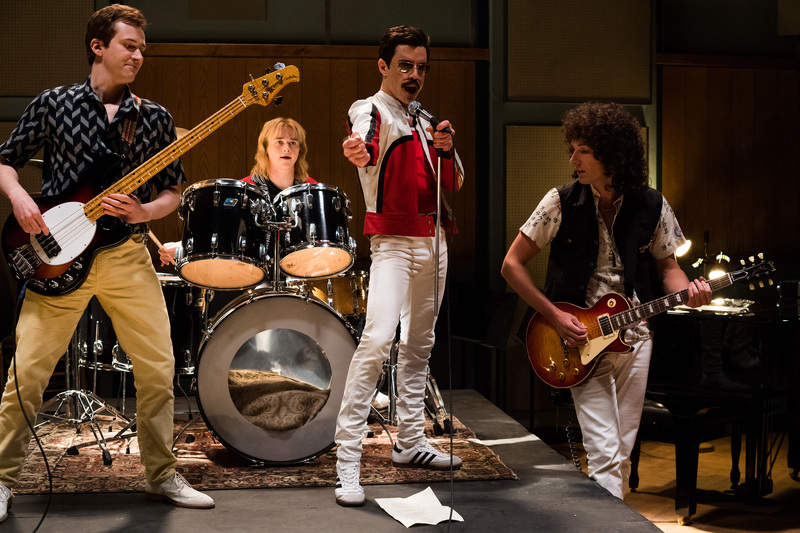 Joseph Mazzello as John Deacon, Ben Hardy as Roger Taylor, Aidan Gillen as John Reid, and Gwilym Lee as Brian May are outstanding and really help to bring to life the relationship between Freddie and the rest of the band. I’ve read of this criticism that the film attempts to hide Freddie’s sexuality, and I didn’t find that to be the case. 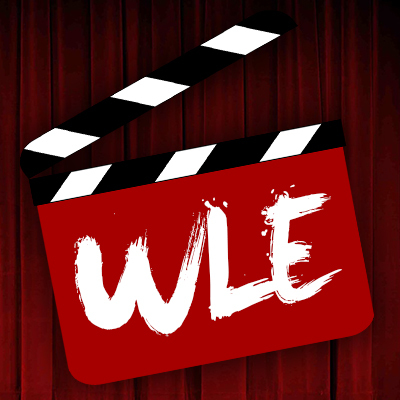 They feature the reality of his life, meeting Mary and discovering his sexuality as he goes through his rise to fame. I think that when we watch films in 2018, we tend to view them through the eyes of 2018 as opposed to the time in which it was set. I felt the portrayal of his sexuality matched the period and what I would imagine to be a very challenging time for him. It has to be noted that the costume, hair, and makeup design team is fantastic. They’ve recreated these icons from the 1970s and 1980s and made them look remarkable. The attention to detail shines in every scene. 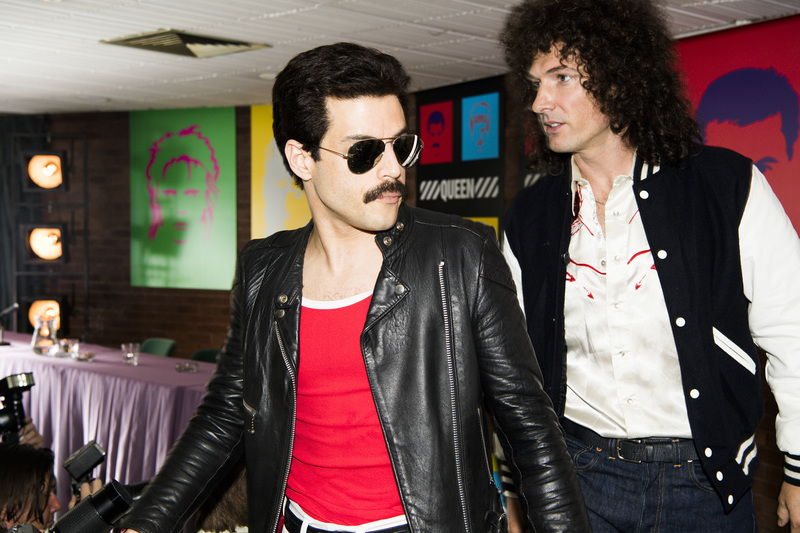 I can’t imagine how long it took just to do the hair for Gwilym Lee who played Brian May. 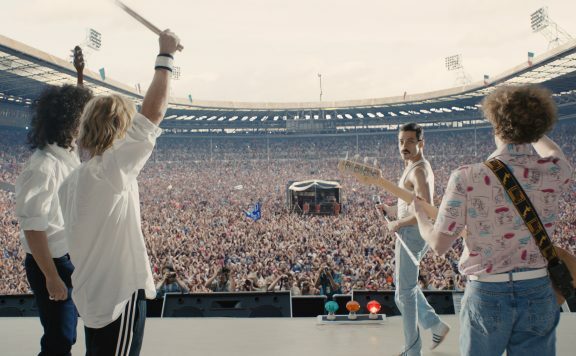 While I think that some critics may dislike Bohemian Rhapsody for it’s sugarcoating and generic bio-pic feel, it is a fan film that will have audiences dancing in their seats. I can see it having the longterm success that The Greatest Showman enjoyed last year into earlier this year. What resonates in the film is the messages that it is trying to send. It is the perfect film to remind us that there is a place for everyone and you can be anything you want. I think that message is even more important today and Bohemian Rhapsody is the perfect film to remind us of that. The huge concert scenes with people arm in arm singing “We Are the Champions” brings a nostalgic tear to your eye. The capturing of these scenes is done in a way that shows both the immensity and the intimacy of these moments. 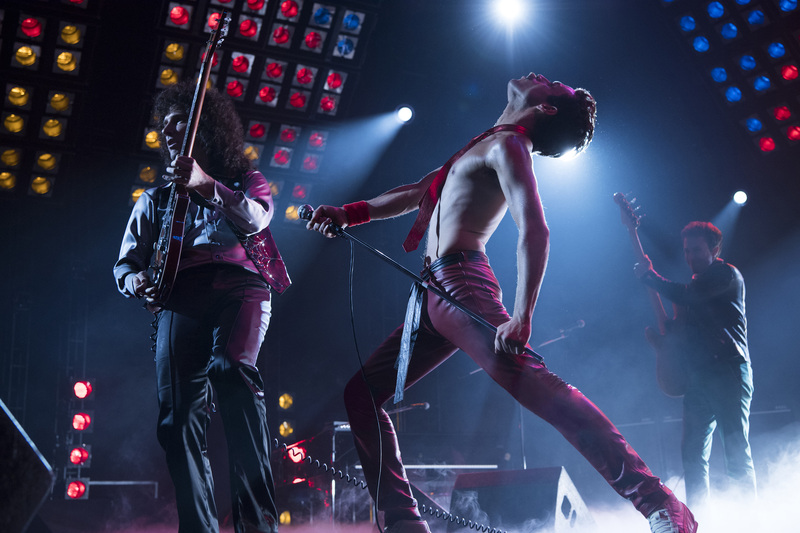 Rami Malek and the rest of the cast will rock you, giving you a much needed reminder that the best person to be is yourself. 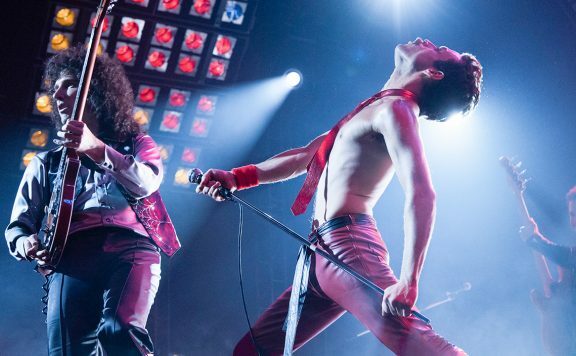 Bohemian Rhapsody Review: Rami Malek transforms into Freddie Mercury for one of the best biopics of all time.